The Dynamic Great Lakes is a must have for Earth Day, Father’s Day–or any day. Send a check for $17.00 to Barbara Spring 1416 Lake Ave. Grand Haven MI 49417 along with your mailing address and I will send you a brand new copy. Let me know if you would like it signed and to whom. Barbara Spring. Barbara Spring is a living and thriving piece of Michigan’s environmental history. With her husband, Norm, she successfully worked for a state ban on the use of toxic DDT in the 1960s. In 1967, Michigan became the first state to cancel most uses of the pesticide. EPA didn’t get around to a national ban until 1972. It could be argued that Norm, Barb and their allies did the most important work of the modern Michigan environmental movement. Other laws and reforms followed their triumph. They weren’t the first or the last to fight DDT, but they were among the most persistent. Norm went to the Grand Haven City Council three years in a row asking the city to stop spraying the elm trees in the city park with DDT. Then along with Ann Van Lente .from Holland the Michigan Pesticides Council was formed and it met in East Lansing with Dr. George Wallace, Dr. Ted Black, both ornithologists who knew what was happening to the birds, other members were: Joan Wolfe, Dr. John Kitchel, H. Lewis Batts, Mrs. Ronald Marlatt, Charles Shick. Their success has contributed to a 90% reduction in DDT levels in Great Lakes fish, and the recovery of the bald eagle. Norm Spring was inducted into the Michigan Environmental Hall of Fame in 2014. Barb has continued her activism and authored four books, including The Dynamic Great Lakes, a non-fiction book about changes in the Great Lakes system, both natural and by the hand of man. She also maintains three Great Lakes blogs. She was 80 when I sent her my questions. Growing up in East Lansing, Barb said she knew little about the Great Lakes since her schools did not teach about them. That changed the moment she saw Lake Superior as a 7-year-old on a road trip with her parents. Close to home are her favorite places, wooded dunes at nearby parks on Lake Michigan’s shoreline. She walks the woods to enjoy the change of seasons and spring wildflowers. Barb has spent decades in the life of a committed environmental volunteer, including service as Water Resources Chair for the Michigan chapter of the League of Women Voters. In that role she reviewed all water legislation in the state legislature and advised the League on whether to take a position. The tannery’s interest in participating was promoted by a little production arranged by Barb and friends. “With friends we put on some theater presentations in our local League of Women Voters,” she said. “One friend came out dressed in a cow hide and spoke about the tannery wastes. Fishermen talked about the colors and stink of the Grand River due to dyes and toxic wastes.” The tannery subsequently paid to treat its discharge in the new wastewater plant for a few years before going out of business. Not surprisingly, Barb retained her sense of wonder. She shared it with Rachel Carson, author of A Sense of Wonder as well as Silent Spring, the book that launched the fight against DDT and other bioaccumulating pesticides. The high wooded dunes rise above the Grand River, as they have for several thousand years, a part of the landscape both residents and tourists in the Tri-Cities area enjoy. For a closer look, people can follow a self-guided nature trail through the dunes. On Earth Day, the community pitches in and picks up debris blown into the dunes by the winter winds. It’s a favorite place for people whether they simply look at it as a familiar part of the landscape, or use it for walking or cross country skiing in the winter for it abounds in wildlife, grasses, flowers, and trees. It’s a good place to study the lessons of ecology. These Dunes, near the shore of Lake Michigan and on the north bank of the Grand River are a gift from the river and the west wind; water and wind currents carried sand deposited by Ice Age Glaciers 4,000 years ago. It is a perfect place to study how a dune land changes over decades, centuries, millennia. It is a good place to observe dynamic changes from season to season, and even from hour to hour. Ecologists say dunes are dynamic because they change rapidly. First to develop the discipline of ecology, Henry Chandler Cowles published his work in l899. His scientific studies of the sand dunes along Lake Michigan in Indiana and Michigan pointed out the relationships between the shifting sands of the dunes and the changing plant communities that survive under harsh conditions. The scientific observations Cowles made in the Indiana and Michigan sand dunes made him the father of ecology. He saw that plants and animals change more rapidly in the dunes than in other places, therefore the dunes made a perfect outdoor laboratory. Cowles’ observations on one group of plants replacing another is called succession. Each stage in dune succession depends upon an earlier stage. The first plants to grow were perhaps nourished by a dead fish that washed ashore. Insects such as the springtail and bacteria and molds broke the fish down into nutrients the plants could use. After their root systems stabilized the sand, and helped build the dune, other plants were able to establish themselves nourished by nutrients in a layer of topsoil formed by decaying matter. Marram grass and sand reed grass are not discouraged by the harsh environment of a sand dune: hot, desert like conditions in the summer, strong winds, and cold arctic conditions in the winter. Dune plants are adapted to extreme heat, cold, and a lack of moisture. The marram grass and the sand reed grass hold the fort on the fore dune by binding the sand with their huge, hair like root systems that may extend down to the water table for a hundred feet. Their stems grow upward even when covered by sand repeatedly. On these dunes, 52 acres, there is a surprising diversity of life which makes its dune scape an ever changing panorama: plants especially adapted to the dune bloom, each in their season: A self-guided nature trail with numbered stations shows the succession of plants in the dunes along the footpath are: horsetails, interdunal ponds or pannes with rushes, sedges and various insects and amphibians. A delicate looking yet hardy plant bearberry or kinnikinick was used by the Native Americans as tobacco, and there are junipers of two types, an endangered species: Pitcher’s thistle, pines, dune grasses, poison ivy, sand cherry, and various types of hardwoods such as red oak. On top of the highest dune are beech and maple. There are also witchhazel trees that bloom in October and sassafras that turn brilliant colors of red and orange in autumn. Some trees are entwined with bittersweet with orange fruit birds feed upon. Dune forests can grow up on dunes that have been pioneered by grasses and shrubs which stabilize the sand and over the years help to build a layer of topsoil that can support tall trees. In the spring, wildflowers such as trillium grow in profusion on south slopes of forested dunes where they can absorb more sunlight. In the open sunny areas of the dune, the yellow hairy puccoon flourishes: its gray green color and fuzzy leaves help it to reflect light and retain water. Migrating birds rest in the high tree branches while permanent residents such as the pileated woodpecker and the horned owl go about earning their livings in their particular niches. Whitetail deer browse on vegetation and red fox feeds upon everything from berries and insects to frogs and small mammals such as the white-footed mouse. With the climax forest, the dunes have produced a diverse community of plants and animals that are an important part of the Great Lakes’ ecosystem. It may have taken a_thousand years between the time the first grasses colonized the sand and the tall trees found enough nutrients for theirseeds to grow. These dunes are not replaceable. They are of more value to the whole ecosystem as dunes rather than as industrial sand or real estate. They protect inland areas from wind damage since wind blowing off the lake will glance off of a tall dune and rise up into the air. They also protect inland areas from flooding, but perhaps their most appreciated value is their beauty. Dune plants may be able to live through harsh summer and winter weather but, they cannot stand up to off the road vehicles or heavy foot traffic. Building houses on dunes may also cause wind erosion when the plants stabilizing the dunes are removed. This is called a blowout and it forms a saddle shaped or U shaped depression in a stable sand dune. 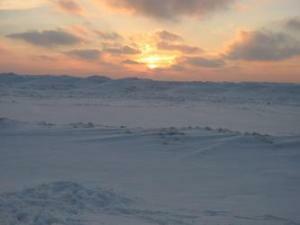 In the past, many Lake Michigan dunes were trucked away load by load since their fine sand has industrial uses. In order to protect Michigan’s coastal sand dunes, the state government passed a law in l989 that will prevent harmful development and protect the dunes we still have left. Governor Blanchard signed the bill into law at Kitchel Lindquist Hartger Dunes. Henry Chandler Cowles would have been proud. In the deep valleys between sand dunes, wetlands with the same sort of living things found in ponds, may appear and then disappear when the weather becomes dry. Before the water disappears, tadpoles may change into frogs and toads. Salamanders may make their transformation from a water to a land animal. With the climax forest, the dunes have produced a diverse community of plants and animals that are an important part of the Great Lakes’ ecosystem. It may have taken a thousand years between the time the first grasses colonized the sand and the tall trees found enough nutrients for their seeds to grow. These dunes are not replaceable. They are of more value to the whole ecosystem as dunes rather than as industrial sand or real estate. They protect inland areas from wind damage since wind blowing off the lake will glance off of a tall dune and rise up into the air. They also protect inland areas from flooding. In the winter, people_cross country ski through scenic dune trails; in springtime, people come to admire the wildflowers and listen to the music of migrating birds; in the summer, people enjoy strolling through the cool forests and playing on the beaches. In autumn, the foliage changes to brilliant colors and dry leaves rustle underfoot. Chipmunks scamper over fallen logs, their cheeks stuffed with beechnuts. Hikers may be alarmed by a snake that rises in a pretty good imitation of a cobra, puffing out its hood to make itself seem fearsome although it is a perfectly harmless snake, and part of the dune ecosystem. It is the eastern hognose snake (sometimes called the puff adder) with its shovel like nose the snake uses to burrow into the sand in search of it favorite food: toads. In fact, toads are the only food the puff adder will eat. There are also a few Mississauga rattlesnakes in the dunes , so if you take a hike, it’s a good idea to stay on the marked trails and keep your eyes open. There is a lot to see and enjoy. Only two wolves are left on Isle Royale. moose population has grown too large for the space on Isle Royale. Wolves will be imported soon since the two left are related and will not breed. Niagara Falls is part of the flowing river of freshwater seas we call the Great Lakes. Niagara Falls takes a plunge into Lake Ontario. In the wooded dunes near Lake Michigan a Great Horned Owl and two chicks are resting in their nest. as it hangs steady in the wind. Pick up carrion—dead white fish with silver fins. For making it that way. Norm Spring won the Michigan Environmental Hall of Fame Award for his work in banning DDT and thereby bringing back the American Bald Eagle and the peregrine falcon to the shore of the Great Lakes. The sun goes down on an icy shoreline in West Michigan. Don’t go out too far since the wind and waves change the ice patterns constantly.